At the end of the ttl keyword you can enter the value on which you want to match. The Time-to-live value determines the maximal amount of time a packet can be in the Internet-system. If this field is set to 0, then the packet has to be destroyed. The time-to-live is based on hop count. Each hop/router the packet passes subtracts one of the packet TTL counter. The purpose of this mechanism is to limit the existence of packets so that packets can not end up in infinite routing loops. The geoip keyword enables (you) to match on the source, destination or source and destination IP addresses of network traffic, and to see to which country it belongs. To be able to do this, Suricata uses GeoIP API of Maxmind. any: one of the directions have to match with the given geoip (’s). dest: if the destination matches with the given geoip. src: the source matches with the given geoip. The keyword only supports IPv4. As it uses the GeoIP API of Maxmind, libgeoip must be compiled in. With the fragbits keyword, you can check if the fragmentation and reserved bits are set in the IP header. The fragbits keyword should be placed at the beginning of a rule. Fragbits is used to modify the fragmentation mechanism. During routing of messages from one Internet module to the other, it can occur that a packet is bigger than the maximal packet size a network can process. In that case, a packet can be send in fragments. This maximum of the packet size is called Maximal Transmit Unit (MTU). With the fragoffset keyword you can match on specific decimal values of the IP fragment offset field. If you would like to check the first fragments of a session, you have to combine fragoffset 0 with the More Fragment option. The fragmentation offset field is convenient for reassembly. The id is used to determine which fragments belong to which packet and the fragmentation offset field clarifies the order of the fragments. The tos keyword can match on specific decimal values of the IP header TOS field. The tos keyword can be have a value from 0 - 255. This field of the IP header has been updated by rfc2474 to include functionality for Differentiated services. The seq keyword can be used in a signature to check for a specific TCP sequence number. A sequence number is a number that is generated practically at random by both endpoints of a TCP-connection. The client and the server both create a sequence number, which increases with one with every byte that they send. So this sequence number is different for both sides. This sequence number has to be acknowledged by both sides of the connection. Through sequence numbers, TCP handles acknowledgement, order and retransmission. Its number increases with every data-byte the sender has send. The seq helps keeping track of to what place in a data-stream a byte belongs. If the SYN flag is set at 1, than the sequence number of the first byte of the data is this number plus 1 (so, 2). The ack is the acknowledgement of the receipt of all previous (data)-bytes send by the other side of the TCP-connection. In most occasions every packet of a TCP connection has an ACK flag after the first SYN and a ack-number which increases with the receipt of every new data-byte. 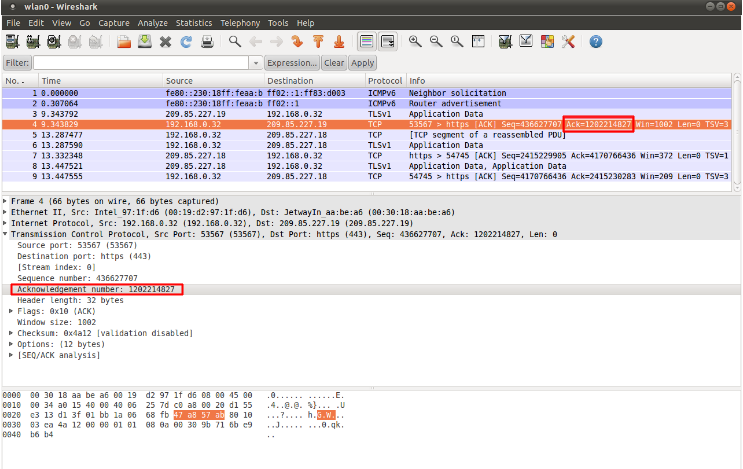 The ack keyword can be used in a signature to check for a specific TCP acknowledgement number. 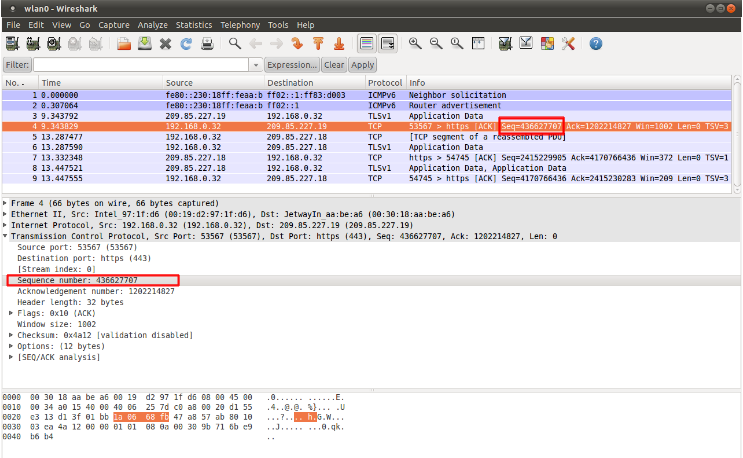 The window keyword is used to check for a specific TCP window size. The TCP window size is a mechanism that has control of the data-flow. The window is set by the receiver (receiver advertised window size) and indicates the amount of bytes that can be received. This amount of data has to be acknowledged by the receiver first, before the sender can send the same amount of new data. This mechanism is used to prevent the receiver from being overflowed by data. The value of the window size is limited and can be 2 to 65.535 bytes. To make more use of your bandwidth you can use a bigger TCP-window. ICMP (Internet Control Message Protocol) is a part of IP. IP at itself is not reliable when it comes to delivering data (datagram). ICMP gives feedback in case problems occur. It does not prevent problems from happening, but helps in understanding what went wrong and where. If reliability is necessary, protocols that use IP have to take care of reliability themselves. In different situations ICMP messages will be send. For instance when the destination is unreachable, if there is not enough buffer-capacity to forward the data, or when a datagram is send fragmented when it should not be, etcetera. More can be found in the list with message-types. There are four important contents of a ICMP message on which can be matched with corresponding ICMP-keywords. These are: the type, the code, the id and the sequence of a message. The itype keyword is for matching on a specific ICMP type (number). ICMP has several kinds of messages and uses codes to clarify those messages. The different messages are distinct by different names, but more important by numeric values. For more information see the table with message-types and codes. With the icode keyword you can match on a specific ICMP code. The code of a ICMP message clarifies the message. Together with the ICMP-type it indicates with what kind of problem you are dealing with. A code has a different purpose with every ICMP-type. With the icmp_id keyword you can match on specific ICMP id-values. Every ICMP-packet gets an id when it is being send. At the moment the receiver has received the packet, it will send a reply using the same id so the sender will recognize it and connects it with the correct ICMP-request. You can use the icmp_seq keyword to check for a ICMP sequence number. ICMP messages all have sequence numbers. This can be useful (together with the id) for checking which reply message belongs to which request message. © Copyright 2016, OISF Revision bef190f7.